Established in 2012, Princeton Piano Studio is located in Princeton NJ. As a newly established facility, our school stresses the importance of a student’s individual development. 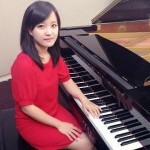 My keen interest in music was established at the age of 4 years old and accepted classical piano training. I currently hold Master degrees in both Music Education and Music Therapy. At New York University Music Education program, I was invited to accompany ensembles, bands and concert choir in several performances in New York City, conducted Women Choir at Bronx High School of Music and taught general music class and group keyboard lesson at Midtown West Elementary school. I successfully prepared many students for ABRSM exam with Distinction categories, and my students frequently receive marks in the High Honors in the state competition, performed at Carnegie Hall and many of them have won scholarships/awards in recognition of their excellence. Let others know about San Jose Piano Studio. Did this teacher help you to learn? How long did you take lessons? Are you still playing music? Share any thoughts or stories you have so that others can know about this teacher!